Yum! The best ice cream on earth!! Its back. Local Thursdays will feature some of my favorite businesses with in the Twin Cities and beyond. Since the weather is getting warmer and the days are getting longer. I thought it would be best to start the summer off with my favorite Ice Cream Shop. Who doesn’t love ice cream? Nothing says summer like a bowl of fresh home-made ice cream. I first fell in love with Izzy’s at the Minnesota state fair. One of there popular flavours is Ruby Red. Ruby Red is like drinking a glass of red wine, but in an ice cream cone. The ice cream is creamy, thick, and made right there on site. So you know that you are getting the freshest product possible. The flavours are endless. Stretching from your traditional vanilla and chocolate, to the wild side of Blue Mountain Spice and Banana Macadamia nut. 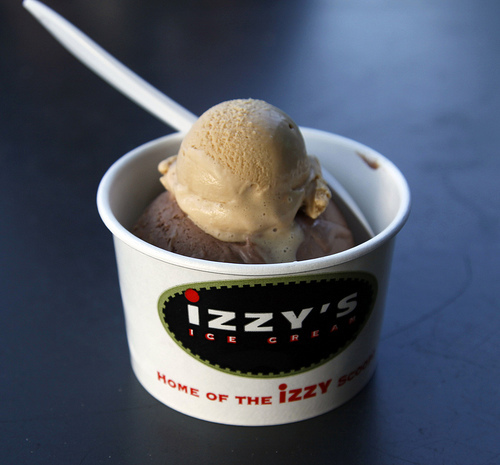 If some tells you “oh I went to Izzy’s and didn’t see a flavour I would like.” You know they never stepped foot in the shop. There is something for everyone. In the summer heat the line stretches out the door. Little kids stand with ice cream covered chins, parents revisit their childhood, and me, I’m lucky if I don’t drop my cone. Even the muppet like dog loves Izzy’s his favorite flavour is also Ruby Red. Please give these hard-working Minnesotans a try, a shout, or jump for joy as their creamy ice cream touches your tongue.